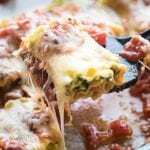 Cheesy Spinach Lasagna Roll Ups - Fun way to make lasagna! Celebrate National Lasagna Day July 29th, 2017 with these Cheesy Spinach Lasagna Roll Ups! It’s a tradition in my family to have homemade lasagna and pizza on Christmas Eve. Other than enjoying lasagna that night of the year, I cannot think of too many other times I enjoy a good piece of lasagna! What is up with that? I guess I needed a National food holiday to get me in the spirit to make these roll ups! Parmesan, Asiago cheese, Romano, AND mozzarella = heaven in a roll up. Watch my video below to see how easy it really is to make! Lasagna hack: turn them into roll ups! Great for portion control and a new way to enjoy lasagna. For the marinara sauce: Heat olive oil in a medium saucepan over medium heat for ~1 minute. Add onion and sauté until tender, about 3 minutes. Add garlic and sauté for 30 seconds longer. Add crushed tomatoes, tomato paste, basil, oregano, red pepper chili flakes, and season with salt and pepper. Reduce heat to low and allow to simmer about 10 minutes, stirring occasionally. Then remove from burner, cover with lid and set aside. For the pasta: Prepare pasta according to directions listed on package, then drain and once noodles are cool enough to handle, align on parchment or wax paper, side by side. Preheat oven to 375 degrees. For the cheese filling: While pasta is boiling, drain the steamed frozen spinach in paper towels, pressing out some of the excess moisture. In a mixing bowl stir together, spinach, ricotta, egg, parsley and season with salt and pepper to taste. In a separate bowl mix the mozzarella, asiago, Parmesan and Romano cheese together. Stir 2 cups of the cheese into the ricotta/egg mixture and reserve leftover cheese for topping on the roll ups! 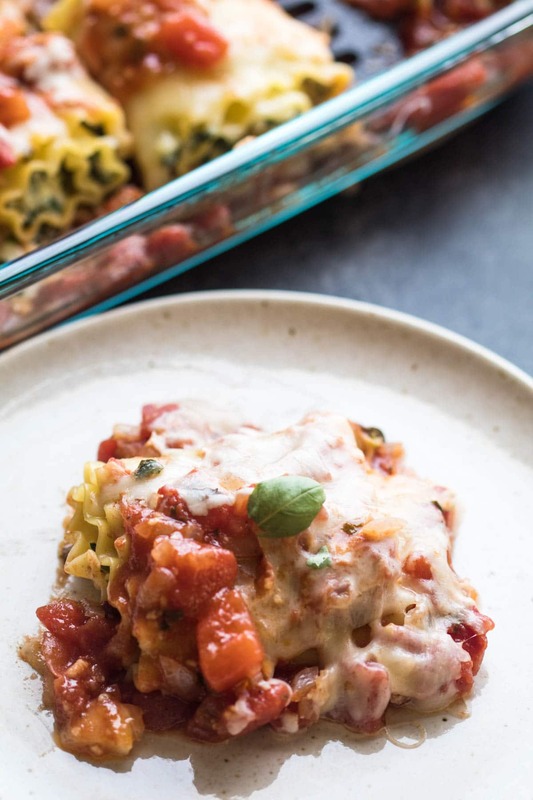 To assemble lasagna roll ups: Spread 1/4 cup of the cheese mixture evenly along length of the noodles (You can just use your hands, it's easier). Roll noodles up jelly roll style to opposite end. Pour about 1 cup of the marinara sauce into the bottom of a 13 by 9-inch baking dish. Place lasagna roll ups in baking dish then cover tops with remaining marinara sauce and sprinkle with remaining cheese. Bake in preheated oven 30-35 minutes, until cooked through. Frozen spinach may need to be heated in the microwave first, then remove excess water with paper towels.